A growing majority of the world’s largest corporations have set sustainability targets that involve increased utilization of renewable energy. These companies have realized that renewable energy investments have a positive impact on the bottom line because they offer a fixed-priced, long-term power supply that protects against rising electricity costs. Meeting these corporations’ sustainability targets will require thousands of additional megawatts (MW) of renewable energy, and represents a tremendous market opportunity. A number of renewable energy projects are already operational across Michigan, and increased demand from corporate buyers will drive additional investment and job creation. However, policy barriers that prevent willing buyers from acquiring renewable resources are stifling market growth and limiting options for companies seeking opportunities to meet corporate financial and sustainability objectives. 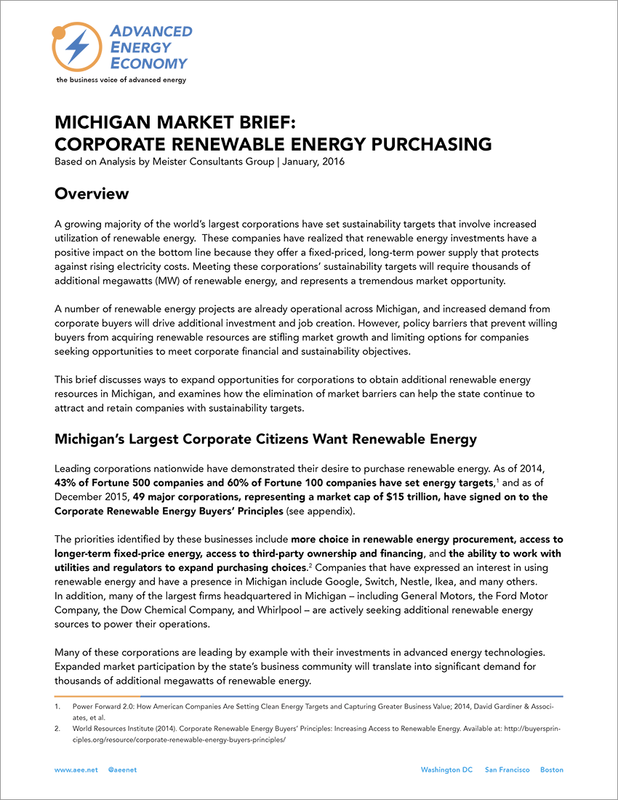 This brief discusses ways to expand opportunities for corporations to obtain additional renewable energy resources in Michigan, and examines how the elimination of market barriers can help the state continue to attract and retain companies with sustainability targets. Please fill out the form to download the market brief.